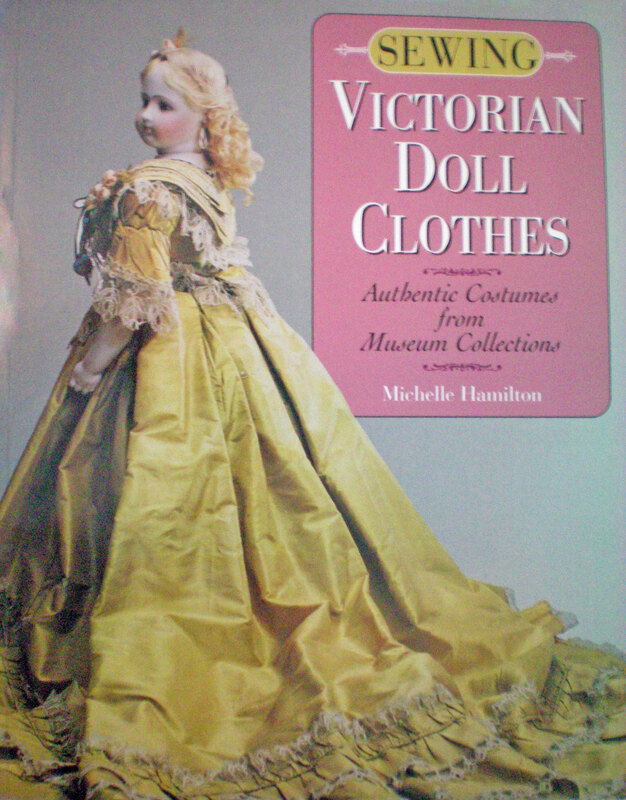 A book that features antique doll clothes representing much of the Victorian period (from the 1830s through 1910). After displaying the garments, it analyzes them and teaches you how to reproduce them using period sewing techniques. 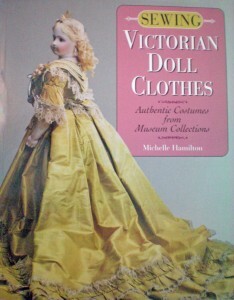 First of all, I drool over this book for the many photos of antique dolls and their original costumes. It goes all the way back to the 1830s, stretches across the 19th century, right up to the first decade of the 20th century. 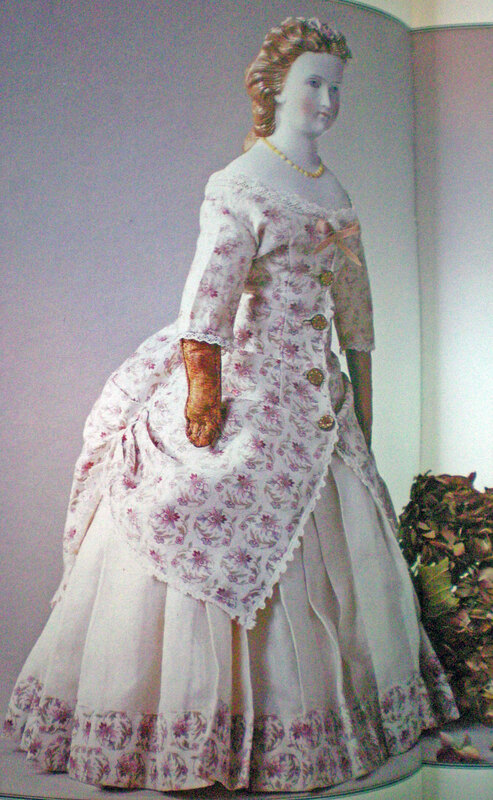 It shows every sort of doll costume from calico wrappers to evening gowns, and even features undergarments such as corsets, bustles, and petticoats! 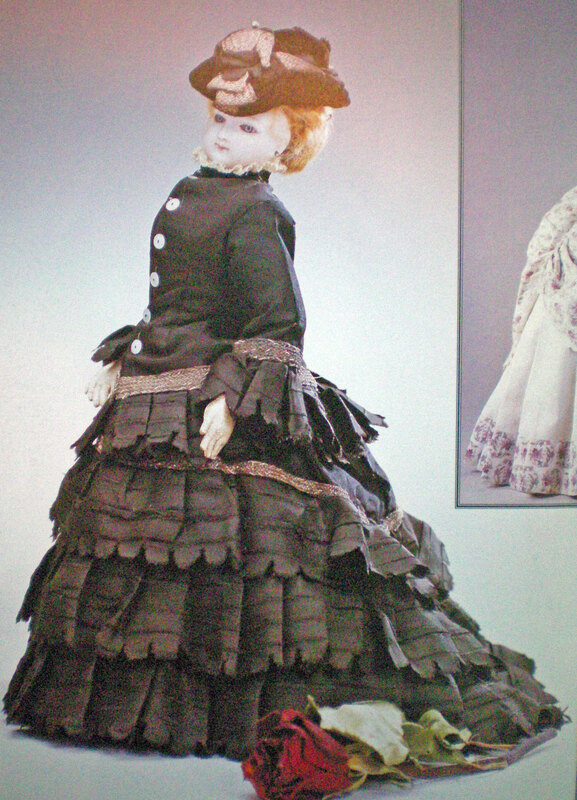 After showing full-color photos of all the dolls, it has chapters that analyze the little garments. It goes into step-by-step detail on how to make these costumes for your own dolls, complete with fetching hand-drawn illustrations. 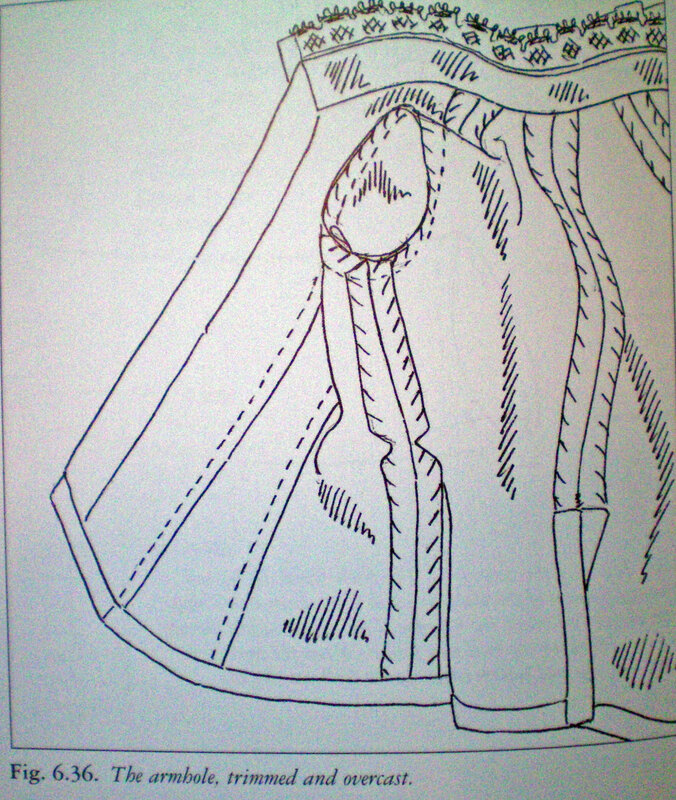 It includes a number of antique sewing techniques, such as piping, flounces, plackets, rolled hems. 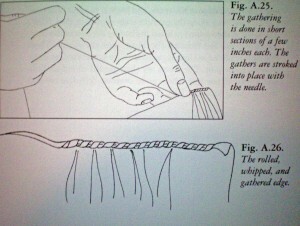 It gives detailed instructions on hand sewing, including a number of different stitches, methods of gathering, attaching lace, and how to make hand-bound eyelets and buttonholes. 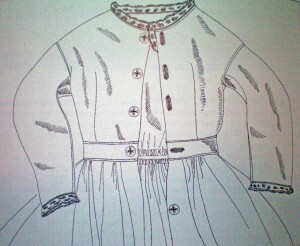 It even talks about how to use respectfully—and carefully—use antique textiles to make reproduction doll clothes. 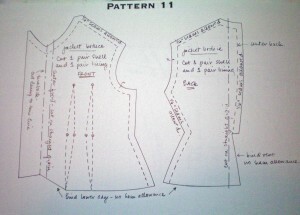 Finally, a large portion of the book is set aside for patterns of the garments shown! This book truly is a gem mine. 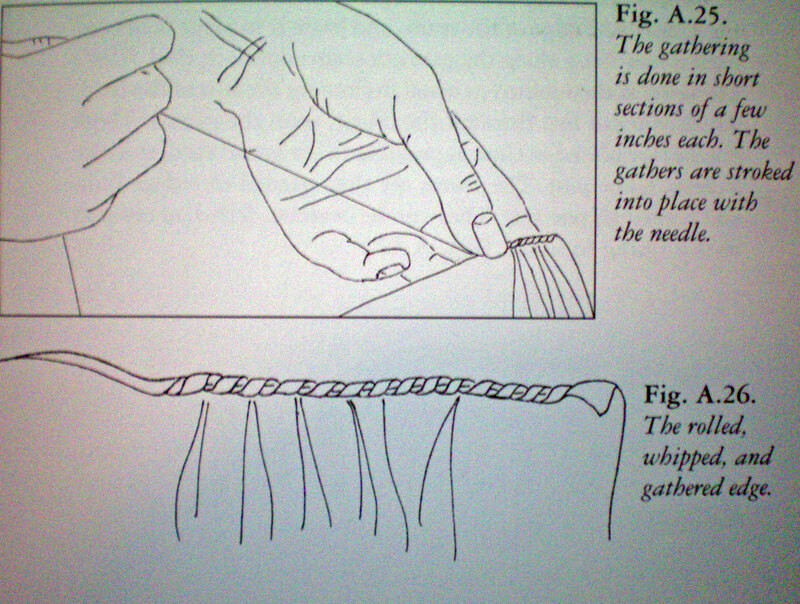 The sewing techniques are invaluable. 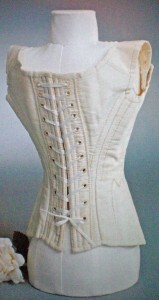 They can easily be adapted for other kinds of sewing, such as modern couture and historic costume-making. There were only two things that I disliked, and these were both omissions. First, it skips a considerable amount of time during the mid to late-Victorian period. 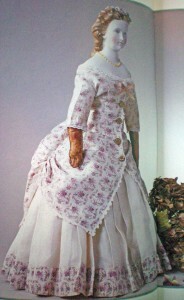 It has several doll dresses from the Hoop-era of the 1850s and 1860s, but only one from the Early Bustle period of the early 1870s and only one from the Natural Form period of 1877-1882. And finally, it has none at all from the Late Bustle or Belle Epoch periods that ran from 1882 to the early 1900s. It skips straight from 1877 to 1905! This is a tragedy, as these periods contain some of the most beautiful designs of the Victorian era. Second, I was disappointed that it didn’t go into detail about how to create corsets, drawers, bustles, or hoop skirts. 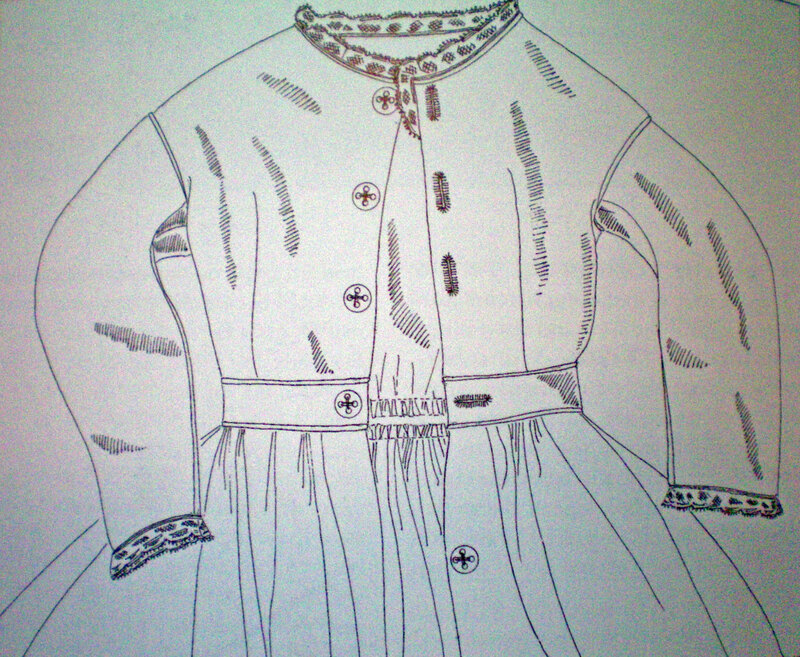 It shows antique examples of these garments, but provides no patterns or instructions. 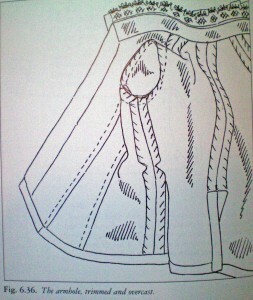 There are directions for how to create a ruffled petticoat, but it omits any other undergarments. This is an astonishingly useful book! I give it a wholehearted five out of five stars. It’s one of the prizes of my collection, because it’s not just for doll-clothes makers, but anyone interested in historic fashion, or even just antique methods of hand sewing. Unfortunately, it’s now out of print, but used copies can be found. Have you read this book? What parts did you find the most useful? 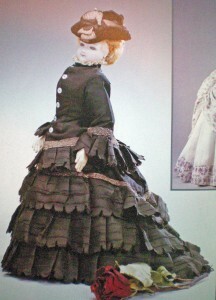 This entry was posted in Thursday's Book Reviews and tagged Book Review, Dolls, Thursday, Victorian. Bookmark the permalink. Am very in clothing. Have the book shown above.